Great graphics and smooth fast game play with easy navigation. Choose your avatar! Each with its own unique characteristics and voice. Large contingent of Aussie players already play on Titan Poker. Chat with Aussies as you play! Online Support button - live support at the click of a mouse, help when you need it! The ability to take notes on players, track your opponents and keep tabs on them. Detailed poker statisics - the best stats I have seen. You'll be able to pin point your actions and see which moves are profitable. Small deposit limit - the minimum deposit on Titan is just $20 USD. Most other sites minimum is $50 USD! 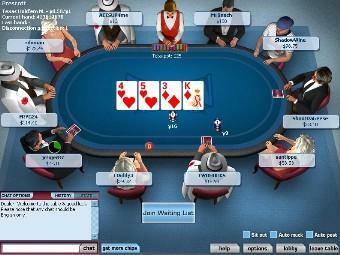 Variety of games - Hold'em, Omaha & Stud poker! As well as casino side games including Black Jack and Roulette. Big tournaments - Weekly tournaments worth 1000's of dollars. Plus heaps of freerolls and qualifiers to WSOP and WPT! Easy money! Because of Titan Poker's large player base there is always a beatable game going on somewhere! If your a shark you'll love the fish on Titan! 100% Sign Up Bonus upto $500 - deposit any amount upto $500 and get that amount free. The exclusive All Aussie Poker monthly $100 freeroll - held monthly exclusively for All Aussie players. Titan's $800 freeroll for new players - a chance to have your slice of $800, free! Titan Poker is a great place to play, sign up today through one of the links on our site or with our bonus code ALLAUSSIE to take advantage of these great bonuses. Australian Poker has a new home - All Aussie Poker - © Copyright 2009 AllAussiePoker.com All Rights Reserved.